The demand for BMW with electric and plug-in hybrid drive continues to be at a high level. In March 2019, BMW's market share in the EV segment was well above the share in the overall market, which clearly outweighs the early decision for a broad commitment in the field of electrified drives. With 27,044 electric cars and plug-in hybrids since the beginning of the year, EV sales are at the same high level as in the previous year, even though the most important new products did not yet contribute to sales. Next to the new 745e, the new editions of the 330e and X5 xDrive45e and the 530e, 530e xDrive and 225xe, which have been fundamentally redesigned with more powerful batteries, will soon be moving forward. Demand for the BMW i3 continues to develop positively. The electric car for the city has been upgraded in recent years several times with new batteries and a correspondingly greater range, which the customers seem to appreciate: In the first quarter of 2019 worldwide 9,227 i3 were sold – 16.2 percent more than in the previous year and more than in every other first quarter since market launch in 2013. The result of the wide range of plug-in hybrids is the high market share of BMW i compared to the shares of BMW's conventionally powered vehicles. 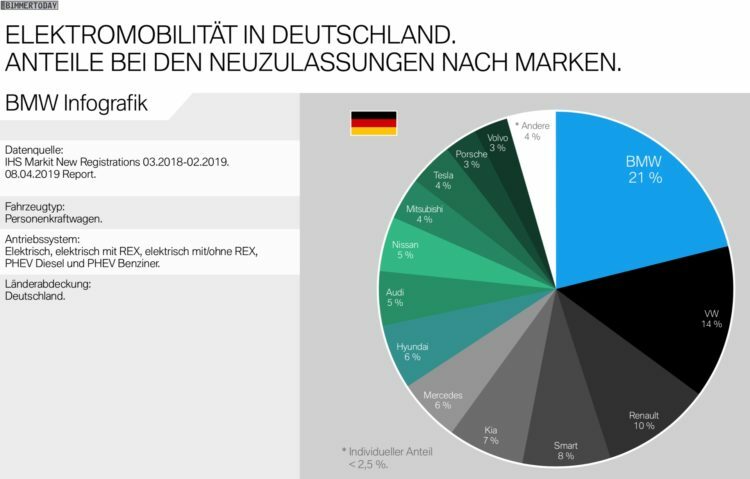 In Germany, the Munich total market share of 8.2 percent, in the electric cars and plug-in hybrids BMW i but comes to almost three times the value and reaches 23 percent market share. The situation is similar in many other markets, as shown in the tables below.